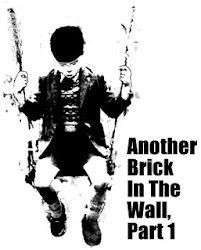 Another Brick in the Wall: Nor Badli charged for CBT, TH to respond to "sotong"
Nor Badli charged for CBT, TH to respond to "sotong"
The Star wrote in March 2015 of the effort of Tabung Haji Heavy Engineering Berhad (THHE) in facing the slump in the crude oil prices. Former THHE CEO, Dato Nor Badli Munawir expressed a glimmer of hope as he responded to Gurmeet Kaur through the e-mail with a bit of gloating of his agility in facing the stormy oil and gas sector [read The Star here]. By end of June 2016, he tendered his resignation [read The Star here]. It turned out that his ability to manouvre THHE to pursue one project after another in different segments of the treacherous waters of oil and gas had ulterior motive. In November 2016 last year, MACC announced they are investigating the former CEO [read The Star here]. Apparently, any JV or out-sourcing of supply or contracts awarded embarked by THHE had kickbacks to Nor Badli. KUALA LUMPUR: A 51-year-old chief executive officer (CEO) of a Tabung Haji subsidiary company was arrested by the Malaysian Anti-Corruption Commission (MACC) today (Wednesday) and is expected to be charged in court today (Thurs) for criminal breach of trust (CBT) involving RM3.3 million. Sources revealed that MACC investigators detained the man at 3.30pm and have taken him into custody to face five counts of the charge under Section 409 of the Penal Code at the Jalan Duta courthouse. The offences allegedly took place between April 30 and October 30 in 2013. MACC Deputy Chief Commissioner (operations) Datuk Azam Baki confirmed the arrest when contacted today. In November last year, the CEO was detained by the MACC for investigations over alleged power abuse and corruption when he held the position in TH Heavy Engineering Berhad (THHE). The MACC had frozen almost RM40 million found in the bank accounts of the suspect and his close family members after his arrest. The suspect had allegedly taken kickbacks from companies he had favoured and awarded work contracts worth about tens of million ringgit when he helmed THHE between 2010 and 2015. 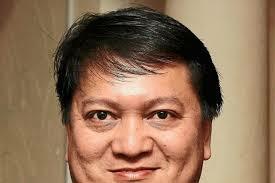 The suspect left the company after taking up the post of director in another government-linked company (GLC). It was hinted in the previous post yesterday here. This arrest is good. Hopefully, it brings Malaysia's Corruption Perception Index ranking lower because real corrupt get charged! If all these actions will result in lower CPI ranking, so be it. But to make stupid claims like Rafizi had done for political mileage, it is not good [read MMO here]. A wrong decision is a wrong decision. What is important is to have more right decisions than wrong ones. And to learn from the wrong move to not repeat again. To lose RM64 million, it is not embezzlement or corruption. Out of investment portfolio of RM64 billion, the loss to Tabung Haji is a pittance 0.1% and could be more than compensated for! Sotong should be commenting on the hot item of the declassifying of Bumiputeraa Malaysia Finance scandal documents by CIA. This is an archiles heel of Tun Dr Mahathir which he worked hard to ignore and not give a direct answer. Yet he demanded answers to merely unfounded, unsubstantiated and spurious links in his 1MDB allegations. Come to think of it, Rafizi was in Standard One and still struggling to spell sotong when Jalil Ibrahim was found dead in a banana plantation outside Hong Kong in July 1984. Read someone with some familiarity in The Mole here. The Management of Lembaga Tabung Haji (“TH”) is concerned about the continued attacks on the organisation, which tend to highlight only the negative aspects of TH. We believe these attacks are politically motivated, and regardless of the inaccuracies, may have far-reaching implications. TH’s focus has always been to achieve the best in Hajj management, business and investments in accordance with Islamic principles, in the best interest of our depositors. We do not and will not allow the organisation to be “pushed” into a position to consistently defend ourselves from unwarranted attacks based on inaccurate desktop and superficial analysis, as we have a bigger responsibility to our depositors – to ensure the fundamental role of managing hajj operations and pilgrims’ funds would be carried out effectively, through good corporate governance and best business practices, giving priority to integrity, transparency and accountability. TH invests in accordance with the prescribed Strategic Asset Allocation, namely: Equity, Fixed income, Real Property and money market/cash. As a fund with a long term investment horizon, TH aims for investment opportunities that can generate sustainable and recurring income with acceptable and appropriate risk tolerance and appetite, via our diversified investment portfolios. The proceeds of our diversified investments in various sectors have enabled us to cover the increasing costs of Hajj operations as well as continue to subsidise the cost of Hajj for Malaysian pilgrims every year, which is expected to increase to approximately RM200 million this year (2017). TH has subsidised pilgrimage cost since the year 2000 and we are confident that our resilience and strong financial standing will enable us to continue to carry the trust placed upon us to fulfil the objectives of our establishment for the benefit of the Malaysian Hajj pilgrims. Nevertheless, in any investment portfolio, there would be a small number of investments that may not perform well at one point or another as they are subjected to volatility of the market whilst the majority of investment are yielding good returns. It is therefore erroneous to judge the success of an investment company without looking at the overall picture of both profitable and non-profitable investments. Every investment has some amount of risks which no one can eliminate completely. Our investment approach is based on “foresight perspective” instead of having the benefit of hindsight like some critics. This investment approach enables us to recognise possible estimated errors and consequently modify decisions for the future. Through experience, exercise of prudence and compliance with various safeguard measures, we are able to manage the risk levels and mitigate any actualisation of risk events. Unfortunately public perception has been swayed by certain quarters which are hindsight-biased, bent on highlighting only on our non-performing investments, ignoring the many successful ones. Every year since its inception TH has recorded profitable financial performance in spite of some losses in specific counters. For those few losses we have made provisions and impairments as prudentially required under the relevant financial and accounting standards. Despite that, we are still profitable and able to give returns to our depositors. In this respect we have done the same for some of our investments in the oil and gas sector where needed, as the industry has been facing one of the most unprecedented turmoil globally since 2015. TH is a long term investor in the oil and gas industry. TH first made investment in this sector in 2001 and has recorded a respectable cumulative RM1.06 billion income from all our investments therein. Many of our investment has been made in strong and performing local Bumiputera owned companies that provides critical services to our national petroleum companies, which help reduces our country’s reliant on foreign oil and gas companies. We see the sector as an industry of national strategic importance. A short or medium term marked-to-market unrealised losses does not and will not change our appetite and our commitment in the said sector. More importantly, it is always pertinent to understand TH’s “savings contract” is based on the Islamic concept of ‘Al Wadiah Yad Dhamanah’ where the savings are guaranteed by the Government, at the same time backed by our balance portfolio of assets. In this context, any allegation that depositors risk losing their savings is false and malicious. This irresponsible act which is guised as “concern for depositors” is nothing more than a political gimmick with no clear understanding of the concept of savings with TH. We again wish to assure our depositors that TH’s financial standing remains strong and their savings with us are safe. Our Islamic savings concept (‘Al Wadiah Yad Dhamanah’) guarantees these savings, as enacted in the Tabung Haji Act. Ultimately, savings in TH is not merely about getting returns but is primarily about the desire to fulfil the 5th pillar of Islam, obtaining “barakah” in this world and hereafter. "Lastly, over and above barakah, there are many other benefits of savings with TH, such as peace of mind that their affairs are fully syariah compliant and from halal sources, zakat are paid for, access to a wide network of about 8000 customer touchpoints across the country, ability to do unlimited number of transactions and many more. We welcome and encourage all Muslims to open their account with TH and register for Hajj." If Rafizi or investing public wants to take issue on the lost of Perisai, blame it on Dato Nazir. He and CIMB stockbroking subsidiary promoted it! 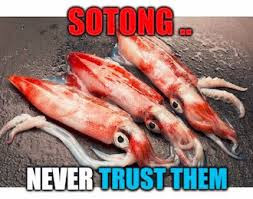 If not Sotong, who else can we trust? RPK, the fugitive who once swore SD, implying that Rosmah was at the scene where Altantuya was C4ed? You do not have to trust Sotong or RPK. But you can trust yourself to take it upon tourself to speak. However anyone desperately need to trust a 4 times court proven liar and a jailbird in waiting have serious morality issue.